The concept for VW's new U.S. plant in Chattanooga is being transferred to new plants in China. BERLIN -- Volkswagen AG's new production chief Michael Macht sees standardizing the automaker's new factories across the world from the U.S. to China as a key goal. The former Porsche CEO , who started his new role last month, said VW group has 61 production facilities worldwide and sells more than 160 models, from the smallest subcompacts to 40-ton heavy trucks. "That's a confusing amount of complexity," Macht said. But VW's new modular architectures will enable the automaker to build its latest factories to a standard layout, he said. 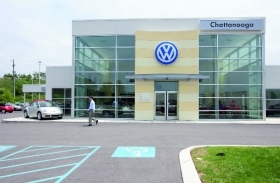 Macht cited VW's new U.S. plant in Chattanooga, Tennessee as an example. Its concept and layout is being transferred to the company's new plants at Foshan and Yizeng in China. Macht said standardized factories will help VW achieve its aim of becoming the world's largest automaker by 2018 while still building quality vehicles, including cars adapted for different markets. VW is planning new, flexible manufacturing concepts for electric cars, Macht said. EVs are "more than just a battery and motor" he said, and there will be new requirements in body and component manufacturing. Initially VW's electric cars will be built in VW's existing factories but when EVs are sold in large numbers, automakers will need to build "green factories" to produce them, Macht said. Employees will also face new challenges and will need appropriate training in power electronics, high-voltage batteries and hybrid modules. VW plans to introduce more hybrid models beyond the VW Touareg and Porsche Cayenne hybrids that are already on sale. "All new vehicles are envisioned for hybridization," Macht said. "So that means the Jetta and the successor to the Golf will be capable of being operated as hybrids." The capability is already built into their modular kits. "Porsche will also bring out the Panamera and Audi the A8 as hybrids,” he said. "And the 918 Spyder super sports car will be on-line in three years at the latest." Purely battery-driven vehicles will also be offered, including the Audi E-tron, the E-Up and the Golf Blue Emotion. Macht was speaking at Automobilwoche's industry conference here Nov. 4. Automobilwoche is a sister publication of Automotive News Europe.